Tina also creates bespoke ranges for museum and heritage shops under Tobyboo. All products produced are made in England and created exclusively. Clients include; St Paul’s Cathedral, Kew Gardens, Soane Museum, Museum of London, Shakespeare’s Globe, English Heritage and Hever Castle. Working with Tina was a breath of fresh air. She came up with creative, quirky ideas that fitted the Globe perfectly. Her products are beautifully made, beautifully presented and price perfect! The brief given was to create a range that illustrated the remedies garden at Kew. Taking inspiration from not only the plants but the Tudor text this beautiful fine bone china tea set was made. 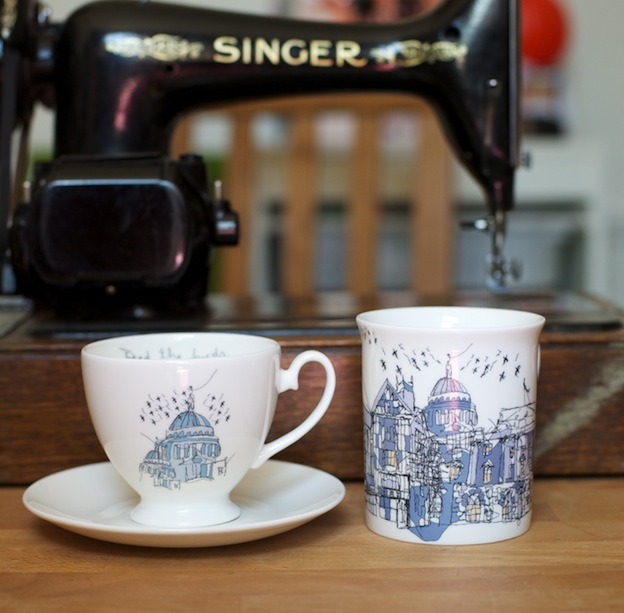 Tina has created several ranges for London’s iconic cathedral with products ranging from fine bone china to leather wear. Creating two core ranges, one illustrating ‘the plays’ and the other with a stitched portrait of the Bard himself.